Carrefour is the big supermarket of Monte Carlo. Here you see just a few of the many check-outs - and as you will see, dogs go almost anywhere in Monaco - and France. 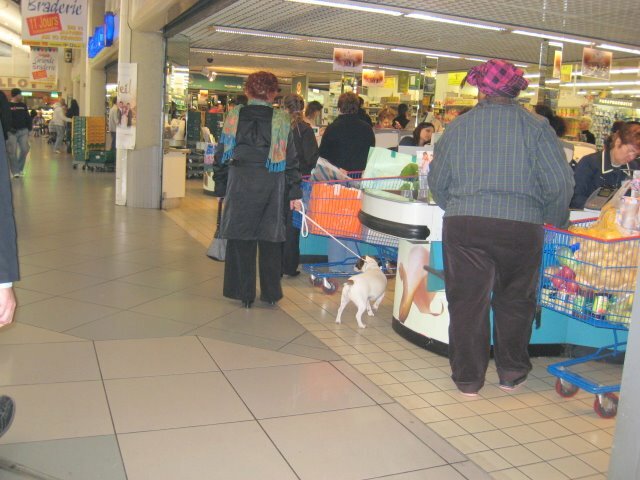 I often see Madame walking around the supermarket with Fifi, her little caniche (poodle) in the bottom of her shopping trolley amongst the brie and jambon. Illegal perhaps but somehow a blind eye is turned...after all, how could she possibly leave her little darling home alone in her apartment. Vive la France! Vive la France, quand même! I've got golden retrievers too and it's not possible to sneak them anywhere! I found the dogs in supermarkets/restaurants difficult to accept at first but after a while I seemed to stop noticing.